Connecting undergraduates to academic foundations and opportunities. 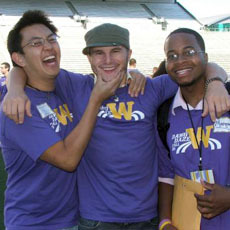 Student success requires early and significant connections to the University of Washington’s academic communities and opportunities. A deep understanding of student learning drives our work to connect undergraduates to the University in multiple ways. Orienting students to the University is the start of their UW academic journey and helps students establish an understanding of the University and the possibilities within it. Establishing and connecting students to a set of common intellectual experiences builds academic community. When students work with advisers to create their academic plan, they learn to successfully navigate the University. Programs in Undergraduate Academic Affairs help students learn about and connect to the University, identify academic pathways that spark their interest, and participate in shared intellectual experiences.